The purpose of the movie making project was to learn about how living creatures are unique by making a movie that explored the concepts of DNA, mitosis, and meiosis.This project not only taught us about cells and the makeup of living things but also how to collaborate with others in a large project. I feel that I, as an individual, met the purpose of this project. I am leaving this project with a firm grip of cell division and how each living thing is slightly different from the rest. I also feel that I have learned how to work with others in a way that makes an impact. As for the class as a whole meeting the purpose of this project, I feel that we did an okay job. I am not sure if everyone is leaving with knowledge about what makes individuals unique but I do think that we all learned a lot about how to work with others. As a class, we worked very well together and think that is something to be proud of. There were many good things about this project. I think one of my strengths in this project was my ability to collaborate with my class in a leadership role. I have not always been the best collaborator but I felt in this project I worked well with the rest of my class. I learned how to be a leader and take charge but also step back and allow other people to be leaders as well. As a class, I feel that we were very good at problem-solving. A lot of issues arose throughout the whole project but we were always able to find ways to overcome them. I think that is why we worked so well together. Overall our collaboration was a big strength in this project. There were some areas of growth that were present during this project. For me, I think one area that I could grow in is my need to have control over everything. During the part of the project where we made the process wall, I didn’t let many people help me. This was because by the end of the project I just really wanted to get it finished. I knew that if I did it, it would get finished. I need to work on having more trust in people and allow them to help me. As a whole class, the challenge we faced was accountability. Throughout this project we made deadlines and they continued to be pushed. People would be gone even when we really needed them. Things would end up not getting done and that was the biggest issue we had. In the future, to deal with this issue I think we should create concrete deadlines that cannot be pushed. This way everyone has to be accountable. We were good at collaborating with each other but I think we needed to step up just a little more. If I could do this project again there are a few things that I would change. Personally, as a collaborator, I would sit back and allow others to help me out more. Project wise, I would keep the format of the project the same. I thought the movie was a really good idea and helped us learn a lot. What I would change is the amount of time we had. It felt really rushed and I just wish we would have had more time. This project was a good learning experience and I really enjoyed it. In the Take Action project I learned new information and skills that were helpful in completing the project. 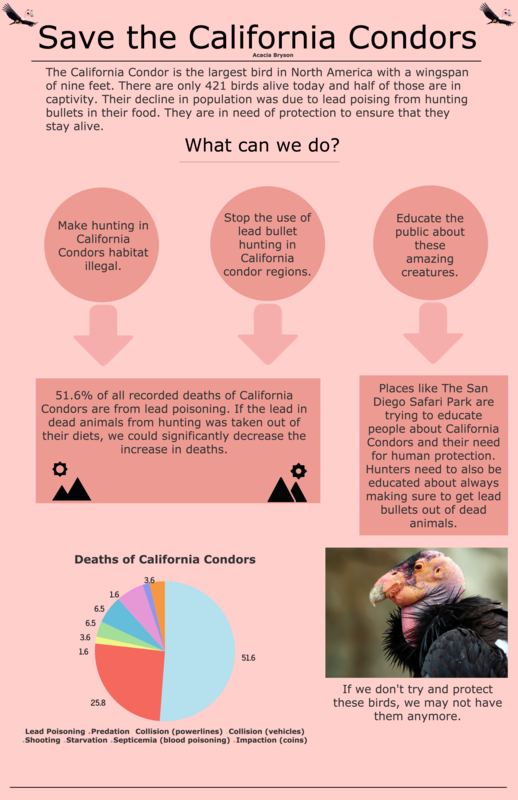 Knowledge wise, I learned a great deal about the basics of ecology and I went deeper on learning about human impact on California Condor mortality. In the beginning of the project we learned about parts of ecology such as abiotic and biotic factors, relationships, and human impacts on ecosystems. All these pieces helped me when completing my final piece because when I started to research the California Condor I was able to have a deeper understanding of abiotic and biotic factors that were harming the birds. As for skills that I learned in this project, there were two main ones that were very helpful. The first skill was learning how to analyze and interpret data which came in handy when researching our project. The data my group used was not very clear and the meant that we had to use critical thinking skills. It’s important to be able to read data and find it’s true meaning because if you can read raw data, you will be able to find the true meeting for yourself. The second skill that I used was the art elements and principles. When creating my infographic I had to use elements such as color and shape as well as principles like balance and space. By using these I was able to create an aesthetically pleasing infographic. Many of the things I learned through with project will help me in future endeavors. I had many new experiences that helped me reach my final project. The first and probably most important experience that I had during this project was the field work we did at Horse Gulch. It helped me to realize how humans impact ecosystems, which was one of the focuses of my project. When we were doing the trail work I was helping create a water way on the trail and while doing this we disturbed an ant hole. When this happened, I realized that if humans didn’t exist, those ants would still have a home. Humans have a large impact on the ecosystems around us. The other experience that I had that helped me succeed was learning to use Venngage. It took me a little while to figure it out but once I got it, I felt comfortable creating my infographic. Both of these experiences helped me to create a final product that I felt proud of. The trail experience helped me to understand that humans really do affect ecosystems and learning to use Venngage helped me create the product I envisioned. This project came with its share of difficulties and realisations. I had some difficulties with the beginning content we learned. The notes we took were good but I felt like I needed some more hands on experience to really get the content down. I am a kinesthetic learner so I need to do more than take notes to get content to stick in my brain. I don’t feel like I have completely learned the content and could use some more practice. Some realizations I made during this project is that humans are kinda screwing up the planet and it is important that we try and stop it. Looking at all the data for my research I saw that almost all the problems in the data were caused by humans. For instance the California Condors population declined purely because of human impacts. I have become more careful about my contribution to these problems harming our earth and this project has helped me come to the realization. If I were to do this project again I would probably refine my infographic and try harder to get it into the exhibition. I really tried to make my infographic aesthetically pleasing and in turn did not refine the information or grammar. I learned a lot about myself and ecology through this project. I learned many skills that I will take with me into the future. I think one of the most important pieces of knowledge that I learned is the affect humans have on our environment and the organisms we share this planet with. One of the things I learned about is the amount of plastic in the ocean. Since learning about this I have stopped using plastic bags to help reduce my plastic output. Since this project I have become more environmentally conscious. Before starting this project I wish I had learned more about how to use Venngage because I had no previous experience with this program and it was a little hard to understand. I feel that if I had more knowledge about this program, I may have been able to create a better product. The field trip that we did and the activities that were hands on helped me a lot to see and feel what we were talking about. The notes however didn’t help me very much because I need to see what we are learning in a more visual way. It helps me to see why something matters to really lock it into memory. I learned how to approach group work better in this project. I have struggled with making people in the group work equally. In this project though my group was a lot better and we actually worked really well. I didn’t just do all the work. I actually let other do work as well.